Triassic Terror is by the designer of Francis Drake as well as the very good War of the Roses. 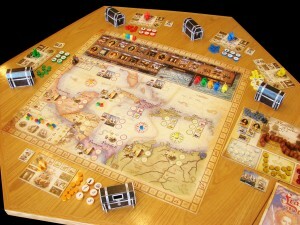 It is an area control game with some interesting game mechanics. 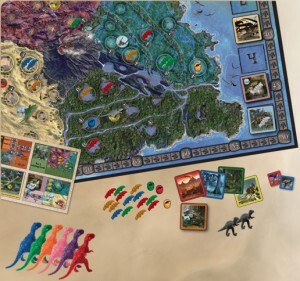 During the game, players place dinosaurs (meeple) of their colour in different areas on the board. A group of dinos of one colour is called a ‘herd’. Players with the largest (and second largest) herds in each of the 12 areas during the 2 or 3 scoring rounds score points, and the player with the most points at the end of a fixed number of rounds wins. 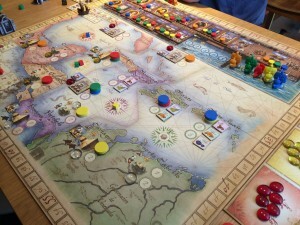 Francis Drake is a game of sailing, looting and plundering. So, already, I’m thinking, what’s not to like? From reading the rules, the game appears to have some very promising gameplay within it too. Before setting out on to the high seas, players prepare for their journey in the streets of Plymouth by buying/gaining guns, crew, supplies, goods for trading, etc. The 18 locations that can be used for these preparations are laid out in a long line (street) and the players take turns using a location by placing one of their 10 action discs on the location. However, players can select an action further down the street from their last action (never backwards). Also, some locations have limited uses and some of the actions on a location are better than others – so players will want to progress slowly so they can use lots of different locations, but move quickly so they are first to use a location and get the most from it. This is very similar to Egizia (one of my favourite games) which is a very engaging game mechanic.